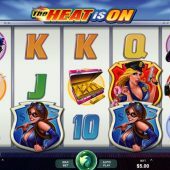 The Heat is On slot is from prolific casino game developer, Microgaming. The game is based on two attractive females and appears to follow a similar mould to their successful 'Girls With Guns' slots - Jungle Heat and Frozen Dawn. We can all be very pleased if it reaches the standards set by those two games and the dramatic chase music that provides the soundtrack gets us in the mood for something exciting. You see, one lady is Policewoman and the other is a masked bank robber and that establishes the story on the reels. We begin with the two main characters as they form the top-paying symbols which are the stacked Wilds. There is also an unusual 45 paylines across the standard 5 reels and 3 rows, with a minimum bet of 50 coins. Both Cop and Villain form these stacked Wilds and are handcuffed together as they appear side-by-side on the reels. Individually they pay 20x your bet for 5-of-a-kind but being inextricably linked they also pay mixed across the reels for a 10x stake win. They have no multiplier attached so the remaining symbols pay flat at 4.5 x bet for the briefcase of gold bars, 3.5x for the Police helicopter down to the lowest of the card icons at 1x stake. The Wilds are the only symbols stacked, but as there are 45 pay lines you will find that many of the smaller wins, say 3 Aces on the centre row will be paid 2 or 3 times as the same 3 positions will form more than 1 of the 45 lines. The remaining symbol yet to be described is the Bank. This scatter appears on all 5 reels and will trigger the game's free spins bonus. The scatters need to be on consecutive reels from the left, but there is a twist to this pursuit - on reels 2 and 3 there are double scatters which can significantly affect the number of games. Three single ones will award 5 spins, 4 will award 10 and five awards 20. If however, you get a double-scatter in any of those triggers the amount is doubled, if both appear your free spins are multiplied by 4. So let's say we get 1-1-2 then the 5 free games become 10. The ultimate would be 1-2-2-1-1 across the reels; you would then have the maximum 20 spins multiplied by 4, giving you a not inconsiderable 80 free games! And this is where we plummet downwards in our expectations - the free spins have no multiplier, extra stacks or enhancements, aside from the fact they can retrigger in the same way.